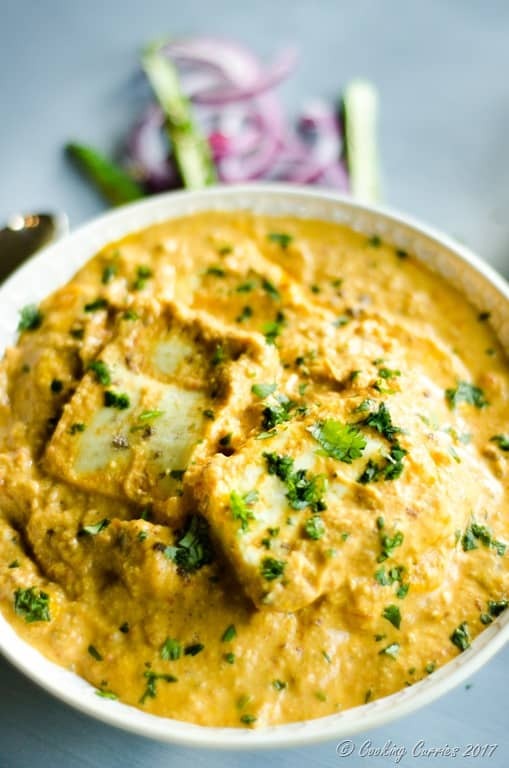 Succulent paneer cubes cooked in a luxurious sauce of cashews, almonds and cream along with some spices rounds it up to this very flavorful royal dish of Shahi paneer. 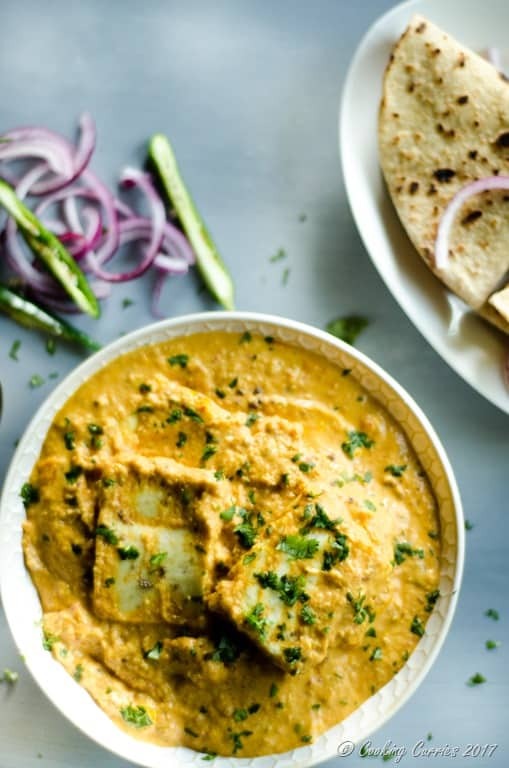 Paneer is such a integral part of Indian cooking, right next to maybe potatoes, that we use it in curries, stir fries, scrambles as filling for pastries and even in some dessert. It is such a versatile ingredient that absorbs the flavor of whatever sauce, spices and other ingredients you use along with it, while still maintaining its own identity. 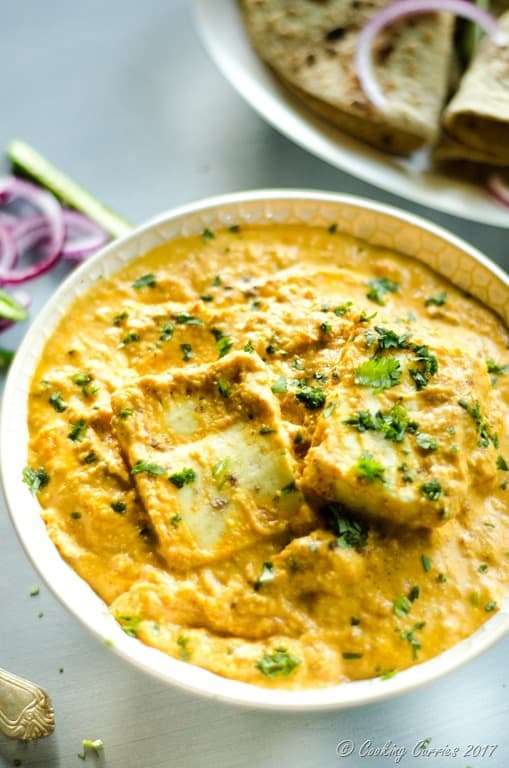 Shahi paneer is a royal dish with a Mughlai influence from the Persian emperors who ruled part of Northern India. The sauce is made with a nut (cashews and almonds) and cream base and there is minimal spice used to not over power the flavors of the ground nuts the cream. 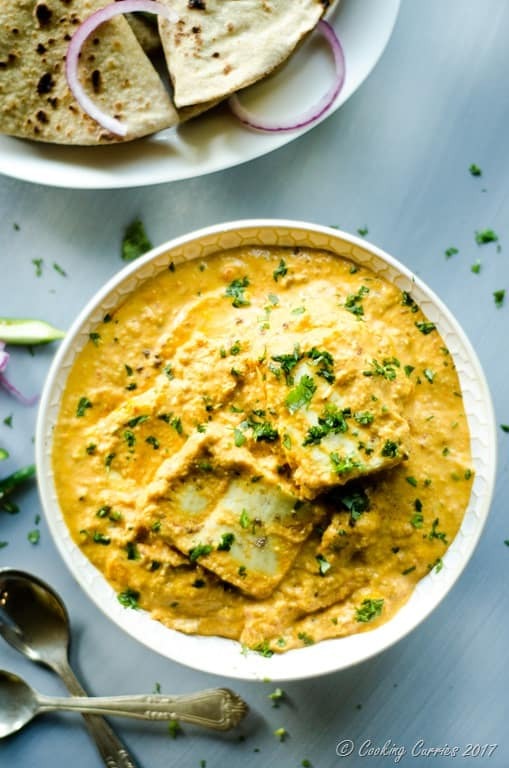 The butter paneer or paneer makhani preparation is slightly different from it in the sense that it is more of a creamy tomato based sauce than the nutty creamy sauce in this. 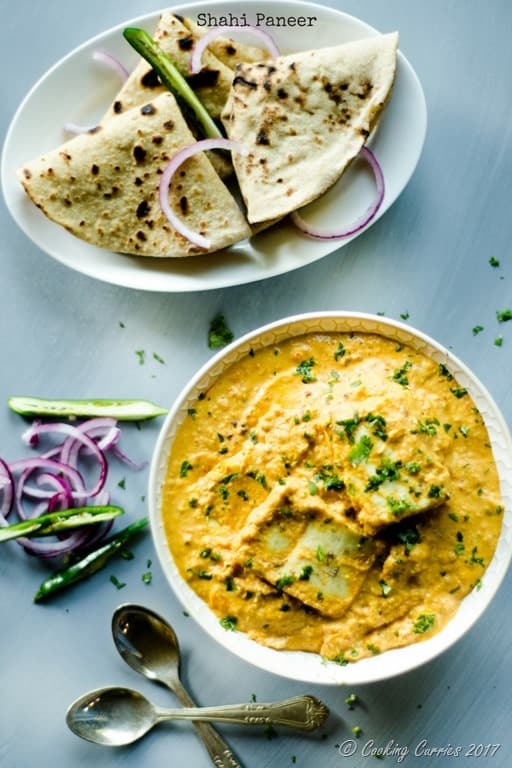 For the Shahi paneer, tomatoes or yogurt is used to give a little zing to it but not so much that they take away the focus from the nutty sauce base. Boil the onions, cashew and almonds in 2 cups if water for 4-5 mins. Drain and reserve the water. Grind the onions, cashews and almonds to a smooth paste. Heat the oil in a pan. Crush the whole spices (cloves, cinnamon,cardamom) and add to the hot oil with the bay leaf. Give it a quick stir. Addd the serrano peppers, garlic and ginger to the pan. Add the onion paste and saute till the oil separates on the side, about 3-4 mins. Puree the tomatoes in a blender and keep ready. Once the oil separates in the pan, add the turmeric, cayenne, coriander, cumin and black pepper. Give it a quick stir and add the pureed tomatoes. Once the tomatoes start bubbling, add salt and some of the reserved water, if the sauce is too thick. Let it come to a boil. Lower the heat the medium and add the cream and bloomed saffron to the pan. Mix well and add the paneer cubes. Let simmer for 3-4 mins. Add more of the reserved water, if you want to thin down the sauce a little. Remove from heat and garnish with ground cardamom and minced cilantro. Serve hot with naans or rotis.